Jordan T. Klein joined Erickson, Davis, Johnson & Walsh, Ltd., as an associate in 2015. 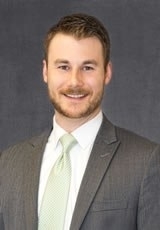 He received his Juris Doctor from the DePaul University College of Law in 2012 and his Bachelor of Science in Business Administration from the University of Illinois at Urbana-Champaign in 2009. While in law school, Jordan served as editor of the DePaul Journal of Art, Technology, and Intellectual Property Law. Jordan's practice includes several facets of civil law including property and personal injury claims, contract negotiation, small business services, estate planning, advising local governments, and insurance litigation. Before joining the Firm, Jordan worked with a civil litigation firm in Chicago, Illinois, where he gained significant trial experience. Jordan is admitted to practice in the State of Illinois, and the U.S. Federal Court for the Northern and Central Districts of Illinois. He is a member of the Decatur Bar Association and Illinois State Bar Association.